This automatic recirculation valve was developed for high and extremely high pressures and also works reliably under highly fluctuating load conditions. With the innovation, the specialist in protective pump fittings is responding to the requirements of its customers, primarily from the field of power plant and plant construction and the offshore industry. The SHP builds on existing Schroeder Valves technology. The individual system components have been modified and innovatively combined, as such that they enhance the dependable and low-wear area of application of the existing technology to meet the increased requirements. Thus, the new SHP-series automatic recirculation valve enables and promotes the energy-efficient operation of modern power plant facilities. 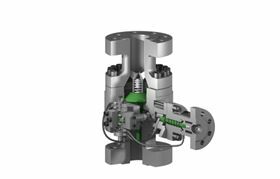 "The SHP takes the general development of higher pressures and temperatures and the increased energy-efficiency requirements into account," explained Axel Mücher, managing partner at Schroeder Valves. "Alongside this, the changing way in which plants work was also taken into consideration in the development of the SHP. Special load sequence power plants, such as modern combined cycle power plants and coal-fired power plants, are operated at partial load for a large proportion of their operating time, on account of the increasing high proportion of regenerative energy generation and highly fluctuating load conditions."